Russia has the most prestigious educational institutions for young people with international interests. For international students, the top rated Universities are that and more: a modern, welcoming and intellectually stimulating place to study in Russia’s big cities of Moscow and St. Petersburg. Each University has a diverse student body of thousands of students drawn from the top ranks of Russian students and from partners like Council for Foreign Education in Russia from around the world. The top Universities of Russia offer a broad range of courses at undergraduate and graduate levels – from engineering, international law, political science, and economics, to journalism, business management, and energy. International undergraduates in Russia can pursue intellectually challenging and exciting coursework alongside their Russian peers. Students seeking a Master degree in Russia can seek a place in one of the many Master programs taught in Russian. There is also an abundance of Master programs taught in English in Moscow, St. Petersburg and Tomsk. There are many Doctorate programs in English in Russia, too. For their historical commencement, Russian Universities are continuing to remake themselves. In the last few years, the universities have formed numerous new partnerships with leading institutions around the world, integrated fully into the Bologna accords and have come out with strict standards like European higher learning institutions. The Universities are also committed to fostering an ever-evolving student body, curriculum, and campus life that continues to reflect its reputation as the most prestigious and most advanced places for understanding international culture, mentality and affairs. The most prestigious humanities institution in Russia is MGIMO. Moscow Institute of Physics and Technology is the leading institute of higher education of the Russian Federation, training highly-qualified specialist in various areas of modern science and technology known as the "Russian MIT" comparable to Massachusetts Institute of Technology, United States of America. National Research Nuclear University MEPhI (Moscow Engineering Physics Institute) is one of the leading Research Universities in the field of nuclear science and the leader in Russia. 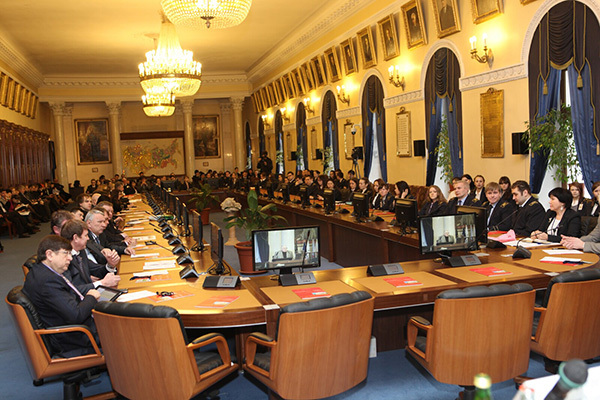 Moscow State University and St. Petersburg State University have a plethora of all encompassing programs which elevates them to the best of the heap. People Friendship University of Russia has more of an international feel than any of these Universities. National University of Science and Technology "MISIS" (MISIS) following Russian Federal Policy in Engineering and Innovations is working to develop research and development projects in prioritized areas of the economy, as identified by the Presidential Administration. Three premier Universities of Russia, which are also scientific centers, located far from the two mega cities are the Tomsk State University, Tomsk Polytechnic University and Ural Federal University. All these Universities are world class in every sense of the term – renowned excellence, independent, coeducational, and of government endowment. Their numerous academic departments, divisions, and award programs, as well as interdisciplinary centers and scientific work programs extend beyond traditional departmental boundaries. Russia's most global universities have been providing an academic home for than 160000 international graduates from around the world for nearly 60 years and enabling them to flourish as leaders in the private and public sector globally. In addition, these premier Russian Universities have close ties with the world's leading educational centers, across Europe, Asia, the Americas, and Africa. They pride themselves on a global focus and them being a home for global students. All premier universities of Russia have joined the European Universities Association and are signatories to the Bologna accords. Their philosophy provides tuition for Bachelor and Master Degree programs which are recognized around the world, with students gaining qualifications which are the keys to employment and academic opportunities internationally. Their Honorary Doctorates have been bestowed on the globally eminent. The premier Universities of Russia offer the widest range of educational programs. When it comes to providing students with a framework for understanding the modern-day world – be it through engineering, science, international diplomacy, public administration, business, economics, law, and journalism, not to mention the languages they teach – they are unique. Russia's premier Universities bring together the best aspects of a liberal arts college, pure science program, applied science program, lab work with those of a major research university. This approach provides students in Russia with close access to thousands of professors and faculty members, including full members and corresponding members of the renowned Russian Academy of Sciences, hundreds of Doctorates and post-Doctorates. With an outstanding reputation and academic status Russia's premier universities consistently rank highly in university ratings. Their researches are extended globally through collaborations with leading research institutes in Russia, CIS countries, and around the world. Under the umbrella of the Ministries, Russian premier universities form an esteemed policy think-tank and forum for debate and analysis of international technological, business, management, political, trade developments and current affairs, with its contributions to global analysis highly sought after. Since their inception, Russian premier universities have their vision and philosophy merged in traditional academic rigor with intellectual innovation. These universities have Russian Innovative Educational Programs, implemented over the years which renew its focus on competency based education. Their programs also enable them to develop a new quality system reflecting contemporary scientific and educational trends, with new management practices and technologies, and attracting international educational leaders. Russian premier universities are renowned for academic excellence, meaning the brightest of Russia's future leaders are studying there now, with an increasing number of their international counterparts. Each year Russia’s best high school graduates compete for thousands of new places, with some programs – especially engineering, medicine, economics, law, and international relations – having up to 30 applicants for each place. The graduates of these premier universities include presidents, prime ministers, and foreign ministers of Azerbaijan, Armenia, Belarus, Bulgaria, Kazakhstan, Mongolia, Slovakia, South Africa, Congo, Ivory Coast, Algeria, Ukraine and other countries. Russian premier universities provide not only an advanced education, but an unparalleled opportunity to gain professional contacts which will endure well beyond formal education. These universities' rigorous and challenging academic framework is complemented by a healthy social environment where the student community and alumni are very accessible and welcoming to foreign students. In this environment today’s students can become the friends of tomorrow’s international political, legal, business and social leaders. Beyond study, international students in Russia will find themselves drawn to numerous concerts, dances, comedy nights, and events in every imaginable sport. Various student organizations fill the calendar with additional social events. Of course, the premier Universities located in Moscow and St. Petersburg, two of the world’s great cities, possess an array of cultural and historical treasures, vibrant culture and dazzling nightlife. They also offer an easy access to the diversity and energy of contemporary Russia, and its epic cultural heritage. Studying in Russia's premier Universities is a wonderful life experience for international students.